WHAT IS THE OPERATING TEMPERATURE OF THE INKJET PRINTER? The rapid development of the advertising industry has also driven the technological innovation of the generation of inkjet printers. People will enjoy more appropriate services while paying the same price. With the improvement of domestic inkjet printer technology, domestic inkjet printers have gradually occupied the domestic market, and more and more people will prefer domestic inkjet printers with higher cost performance when choosing. With the advent of winter, the temperature is getting lower and lower. Many users have such questions. Sometimes the inkjet printer work is not so smooth. What is the cause? How to solve it is better? We want to tell you that this is because of the influence of temperature on the inkjet printer. When the inkjet printer is working, the working environment, the indoor temperature of the work, and the inkjet printer also have some influence. First, after the temperature is lowered, the most common phenomenon is the “false plugging” of the nozzle, that is, the individual nozzles are “broken”. Because the same ink, the temperature is lowered, the viscosity will become larger, the viscosity is too large, and it is easy to print at high speed. A “broken wire” appears. Many inkjet printer users will think that the nozzle is blocked, but once cleaned, it will be normal immediately. It will not repeat for a long time, and some customers will think it is a problem of ink quality. This is followed by the problem of ink absorption and drying. If the temperature is too low, it is not conducive to the absorption of the ink by the inkjet medium coating, and is not conducive to the evaporation of the ink solvent. Caused the phenomenon of “stacking ink”. Therefore, the majority of users should maintain a suitable temperature when using in cold weather, which is conducive to the normal operation of the inkjet printer. Here are several common sublimation problems and the ways to minimize them to help users to get rid of time-and-material costs. Being the most common problem among all digital inkjet printing systems, banding refers to lines of missing ink on the printout. It happens most often due to clogged print head nozzles and naturally streaks of missing ink on the printout. If ink dries inside the print heads, consequently, banding occurs in prints. If you are regularly printing, even one day in a week, you probably will not have any banding issues. Some suppliers suggest daily maintenance to their users. The best way to deal with this is to run the printer machine to prevent the ink from drying up. You can run a small quantity of ink through the heads on a routine basis by using the head cleaning function of the printer. In the case of some printers, this is done automatically. On the other hand, you will need to perform a manual head cleaning for other printers. If you’re having an issue with banding, it may have some other causes besides just clogged heads, such as running out of ink. In that case, make sure that you still have plenty of ink in your machine. Transfer paper and substrate are two key materials to get optimum results in sublimation. If the paper shifts or is not firmly planted against the heat press or the inks is not dry during the pressing, then the result will be ghosting. Ghosting is when the print ends up with a blurry image and an image like shadow. When ghosting occurs, all printing efforts of manufacturers are gone in vain and obviously it will add burden in terms of time and cost. To prevent this, make sure that there is tight fit between transfer paper and the substrate and ink is dry. Although some users manufacturing short run productions or use a minimal amount of tape to secure the transfer to the product, of course, it will not be a good solution since the tape used can leave a mark. Ideally, Transfer papers especially used for wide format printing should adhere to the substrate. The transfer will be lifted off the surface, quickly and cleanly. Alternatively, transfer paper is firmly sticked to the substrate and does not slide along the surface of the substrate, preventing ink overflow and yielding best results without any ghosting problem. With the evolving technology, new advancements in printing industry are made every day. 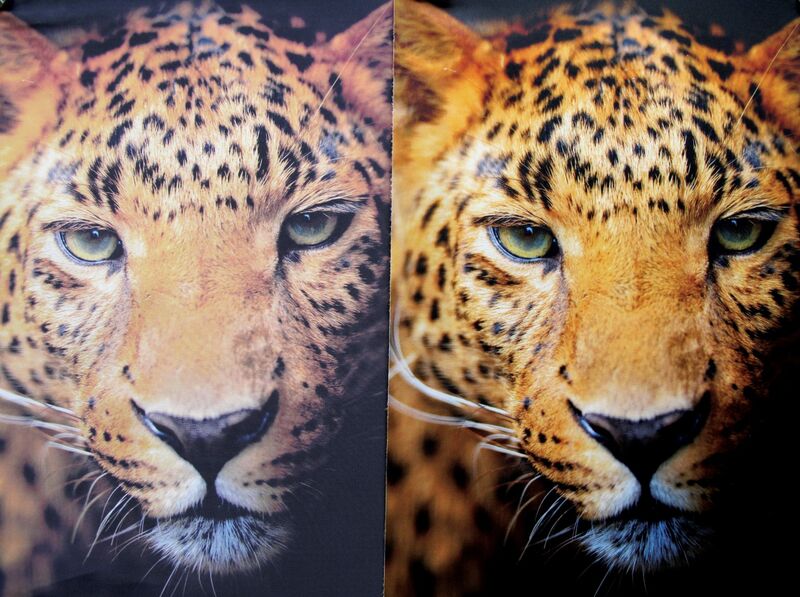 But do you know what is the difference between inkjet printing and sublimation printing? Today, we are going to introduce the quality difference between them. Inkjet printers create a picture composed of little dots of ink, so small that you can’t see them with magnification. This explains, however, why an image printed by an inkjet printer may look grainy if you look at it close-up. These dots can have different colors so that when you view them all together, it creates an image like the ones you see printed. Depending on the brand of printer you use, they may have different methods for getting the ink on the page, but the general idea remains the same throughout all companies. An average inkjet printer can print what is called 600 dpi, or dots per inch, which is quite a few dots in a small space, but it is doable since these dots are so incredibly small! The word “sublimation” gives a hint as to how this process works, as it means to heat something up to turn it into a vapor, and then turn it back into a solid. This is what these printers are doing as they create an image on a page. The colored pigments that are in films within the printer are heated and released onto the page, where they then solidify again as they cool down. The pigments mix to create the perfect color necessary for the specific image being printed, which creates a very vibrant, true color. For photographs and high-resolution images, sublimation printing offers the best quality between the two, due to a couple factors. One of these factors is that the dye used in sublimation printing is mixed to get the exact right color, whereas in inkjet printing, the color is achieved by mixing different colored dots. The true color of the sublimation dye allows for a higher-quality colored image. Another factor is that the dots produced by inkjet printers allow for white gaps between the ink, and while this may not be visible to the naked eye, it does make a difference in the resolution of an image. A great benefit to sublimation printing is that its color is continuous, rather than broken up by white spaces like the inkjet printing is.